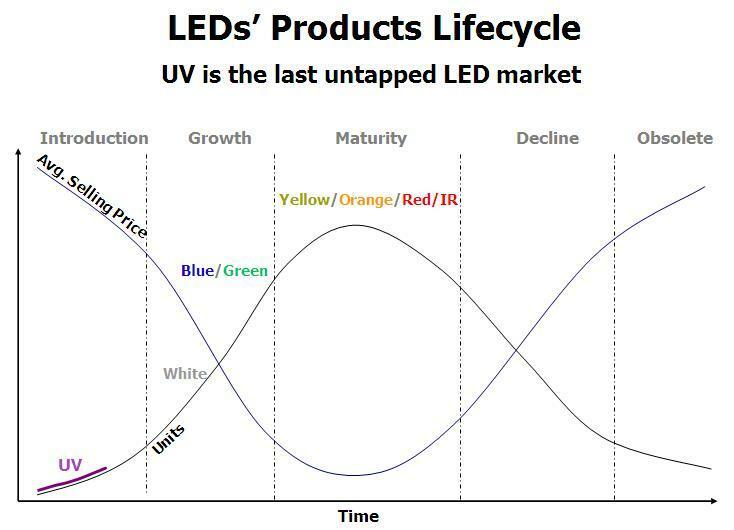 UV LEDs are the infants in the LED products family. UV LEDs share all the advantages of traditional LEDs in addition to being a direct and highly viable replacement option for the mercury tubes. The mercury tubes emitting UV light are considered clean-tech in many industries such as curing and water purification; however mercury tubes still contain mercury which is a toxic substance. The UV LEDs are bringing clean-tech to clean-tech by being a viable replacement for various applications using mercury tubes. UV LEDs are a viable substitute to mercury tubes in many applications and because of the inherent advantages of being a solid-state light source they are also enabling a plethora of never before possible applications. FoxUV™ LEDs have peak wavelengths in the ranges of 360-365nm and 350-355nm. The wavelength of FoxUV™ LEDs is extremely consistent: typically +/- 1nm; the forward voltage range is also typically +/- 0.2V; thus eliminating any need for binning. © The Fox Group, Inc. All Rights Reserved.